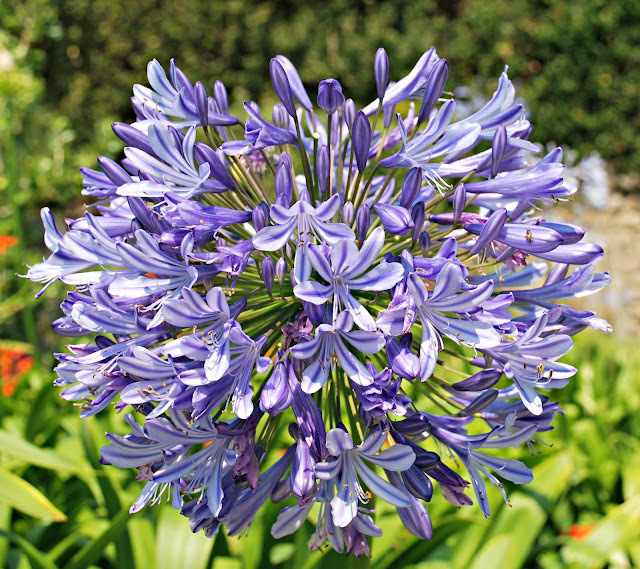 I have to confess to having a soft spot for a good Agapanthus. I bought my first one over 20 years ago (yes, I am that old). At the time I was enjoying a hipster lifestyle in trendy Notting Hill. I had a little apartment on the top floor of an old town house, which had a huge roof terrace. And that roof terrace used to make my heart sing. I'd given it a country house feel by covering it with gravel and planting up some sturdy perennials in a mismatched assortment of enormous planters that I'd bought at auction. I had a bust of Mozart on a plinth, and a little wrought iron table and chairs out there. It faced away from the traffic, and I used to go out every morning with my first cup of coffee to enjoy the relative calm of my tiny oasis. 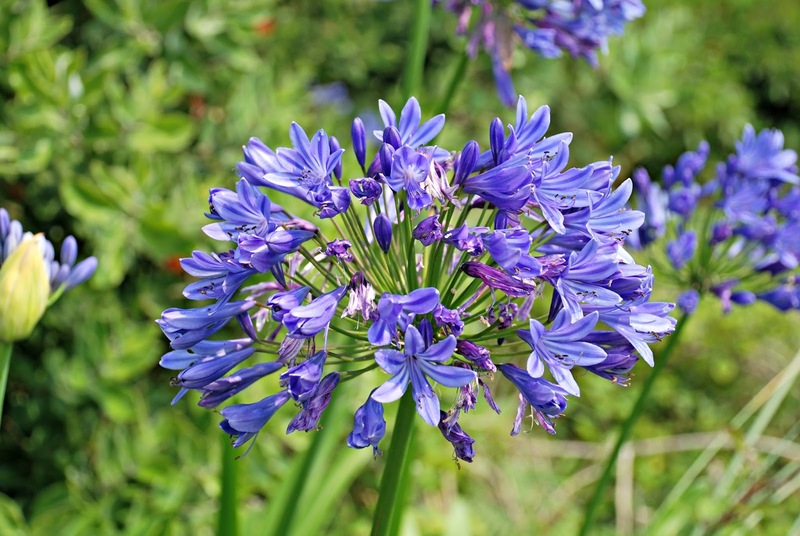 And one of the very first perennials that I planted was a sweet little Agapanthus. I traded up, and moved apartments a couple of times before I got married and came to live with my husband in the burbs. And my little Agapanthus came with me wherever I went. It was repotted a few times. And then I tried planting it here in my suburban back garden, but it really didn't like having its toes in the open soil, so I dug it up and put it in a pot again. It grew and grew like Topsy in that pot, until it was so root-bound that all the soil was either washed away or pushed out the holes in the bottom. The pot split under the pressure of the roots, and I knew I had to do something radical. 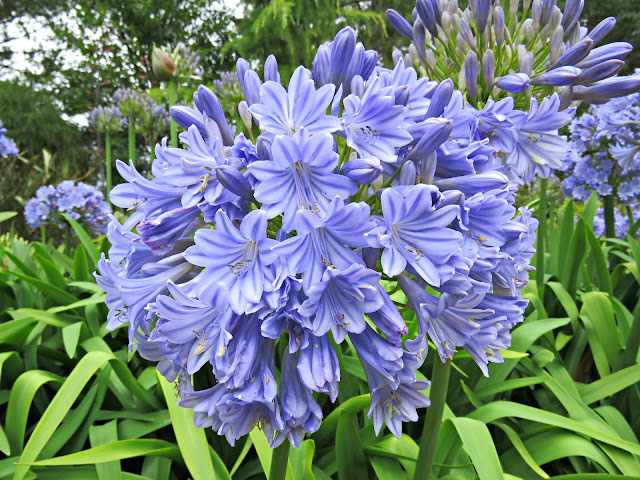 I'd read that they were pretty tough, and I'd paged my way through a few how-to-divide your too-big-for-any-pot agapanthus guides on the internet. So, one day, about 10 years ago, I took my jigsaw to it, and cut it up into quarters. It was a crude, and messy operation. Afterwards I repotted each quarter in a not-very-big pot. The trick with the Agapanthus is to make it live in a not-very-big pot. It likes to feel that its shoes are too small leaving its roots feeling a bit squeezed around the edges - so a not-very-big pot is the only way to go. I kept one quarter for myself, moved another down to Devon, gave one to my mother and another to someone else - I can't exactly remember to whom at this remove in time. So far as I'm aware all four quarters grew splendidly in their new homes for their new owners. 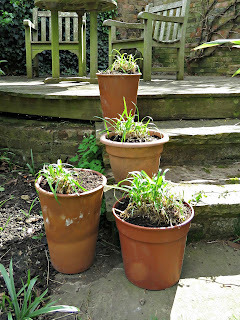 And my own quarter Agapanthus re-adjusted itself, and set about growing normally, getting bigger and bigger in its terracotta pot on the little terrace just outside the door to my laundry room. Every year it threw up delicate plumes of cornflower blue flowers, which delighted me with their colour and lushness. And then, with my son going to school, my own summer cycles changed. We were always away in July and August, making the most of his school holidays - as opposed to taking advantage of the lower prices outside of term time. Each year for a number of years in succession I didn't notice that my agapanthus had flowered until I came home and saw that it needed a bit of tidying up for winter. Truth be told it was sadly neglected, and ought to have had a few pot upgrades over that time, but then, last winter, when I was doing my end-of-season tidy-up, I noticed that it had burst its pot again. It may have been assisted by a few errant footballs, kicked with more enthusiasm than accuracy by my son and his chums, but there was no doubt about it: it had reached the point at which it was totally root-bound again. 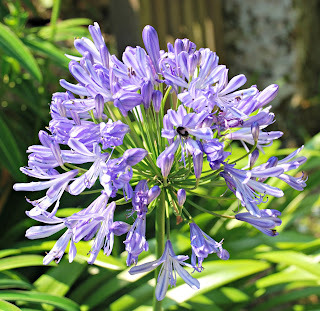 So last week the Agapanthus cycle started all over again. I cracked open the terracotta pot with a hammer. I'd waited for an afternoon when son wasn't around, because I knew that he would find the whole business of removing a terracotta pot with a hammer too delicious not to be repeated ... 😻. Have you ever tried it? At the risk of sounding like a vandal: it's totally brilliant! With controlled whacks the hammer breaks off the terracotta in the most pleasing way imaginable. 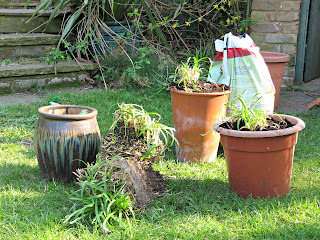 And, of course, I gathered up all the bits of broken pot to use as drainage gravel in other planters. 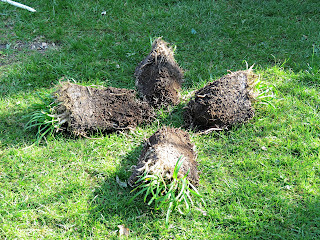 Then I rolled the Agapanthus out onto the grass. It had become so root-bound that I could see the shape of the flange around the lip of the pot in the shape that the roots had grown into. 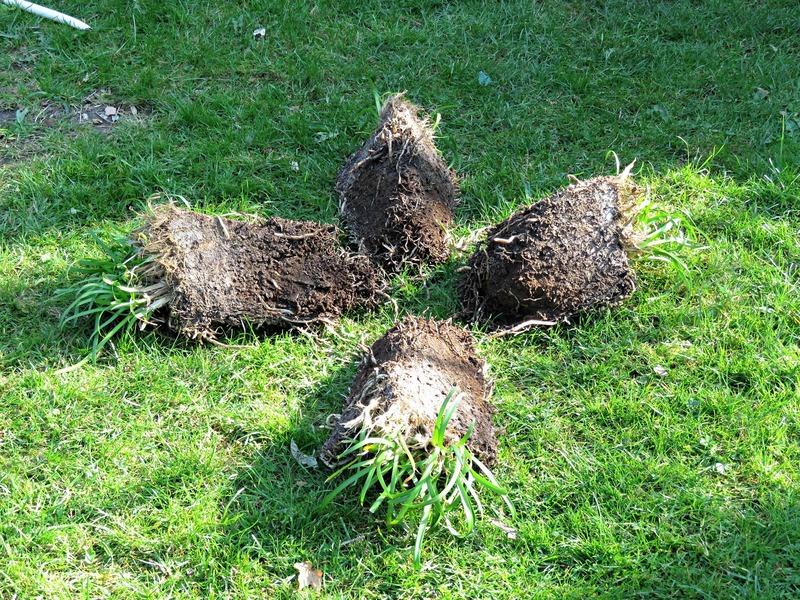 And it was mostly a white root ball with hardly any soil there at all. I confess, it made me feel guilty, very guilty, for all my neglect. Taking a wood saw I cut it into neat quarters without all the carnage that I'd produced a decade earlier with my jigsaw. And then I left those quarters in my potting shed for several days, so that the wounds that I'd made with my saw could scab over. Provided you give these wounds time to close, the Agapanthus has an excellent chance of recovering from this brutal surgery. If you pot it up before the wounds have sealed you risk allowing pathogens from the potting compost to enter the plant's tissues, which may then turn into a gangrenous mush. 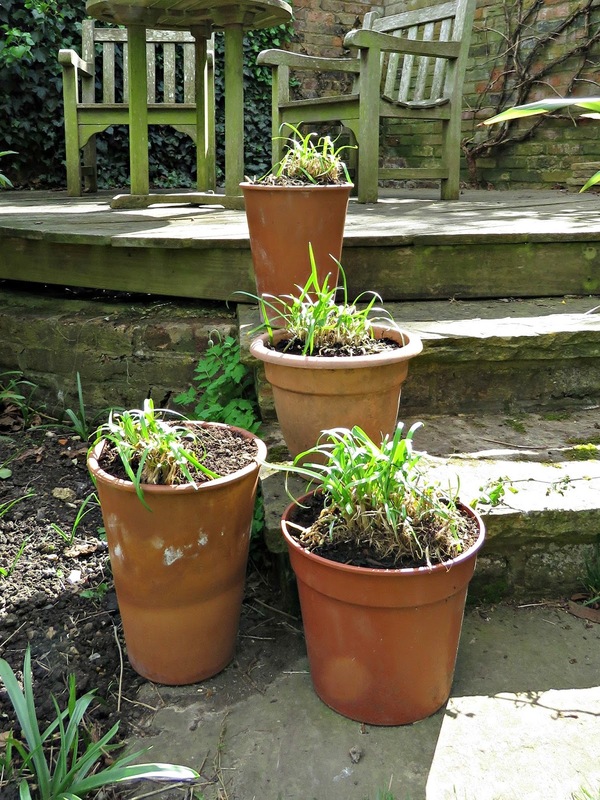 Yesterday in the glorious sunshine of the warmest day of the year so far, I repotted my four agapanthus quarters. And now they're looking good for another 10 years. Bring on the sunshine! 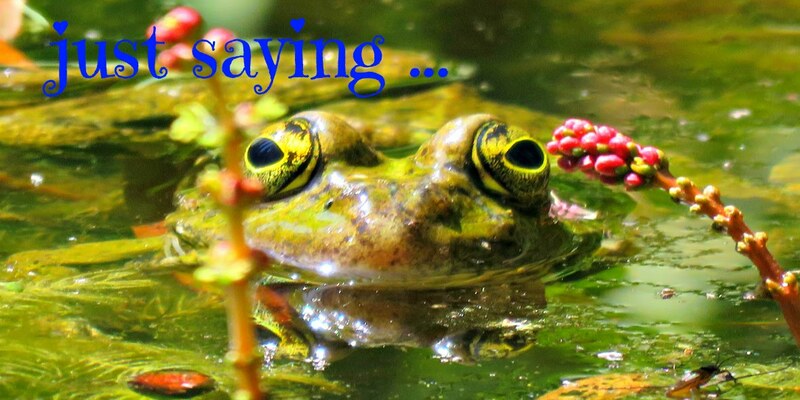 This is a wonderful plant, and I swear there is a kids story in this post! It has sure been an enjoyable read. Thank you, Rose. Glad you enjoyed it! 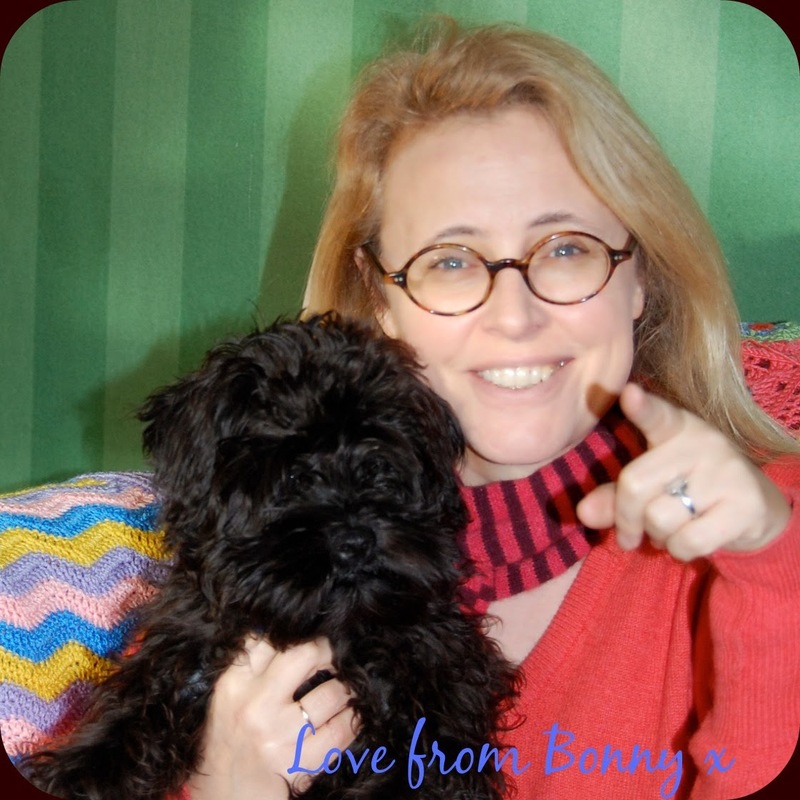 nice blog Bonny X. I also love the Agapanthus and grow them in the ground here in Central New York and have had good success collecting and propagating seed to share seedlings with fellow gardeners. Thank you, Harold. Gosh that's impressive! I must have a go at saving some of my seed to propagate too.